It’s official! 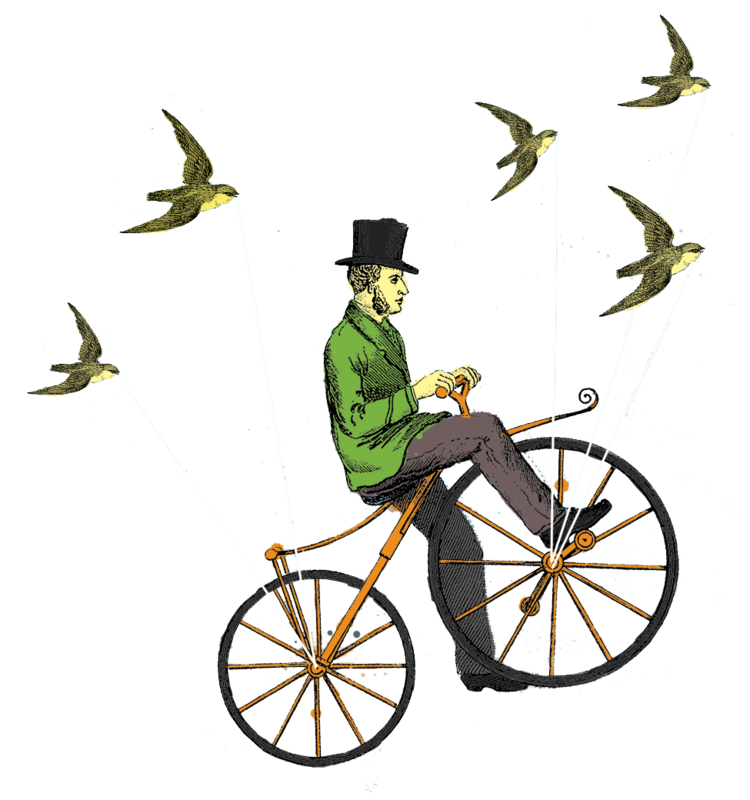 The Local Crowd (TLC) Monadnock, a community-based crowdfunding program serving the entire Monadnock region, is one of four pilot sites across the U.S. participating in a National Science Foundation research project. The project will assess the effectiveness of our crowdfunding program as a tool for community building and economic development. Crowdfunding is the process in which an entrepreneur, business or organization asks a large number of people (usually through the Internet) to contribute small amounts of money to support a new business or project. "The National Science Foundation supports startups and small businesses with the most innovative, cutting-edge ideas that have the potential to become great commercial successes and make huge societal impacts," said Graciela Narcho, Acting Director of Division of Industrial Innovation and Partnerships at NSF. "We hope that seed funding will spark solutions to some of the most important challenges of our time across all areas of science and technology." What makes this year’s TLC Monadnock program different from past years? This year, we’re focusing on social enterprises, mission-driven for-profits and non-profits using business principles to make the world a better place. Examples of social enterprises include benefit corporations, cooperatives and other triple-bottom line businesses like W.S. Badger in Gilsum and Green Energy Options in Keene. We’ll continue to build on the power of Internet crowdfunding and provide even more on-the-ground support to our campaign teams. We invite existing and emerging social enterprises to learn more and apply to our program before May 10, 2019. Specifically, we’re looking for social enterprises interested in raising $15,000 or less for their business (larger amounts can work but please reach out to us first before you apply). Projects need to have simple, achievable goals that will generate real excitement in our community. Proposals can be part of a bigger project but should also have stand-alone value. Most importantly, potential campaign teams need to demonstrate how their project will deliver economic benefits to both their business and the community they serve. We’ll give preference to projects that align with their respective city or town’s master plan and strengthen our Local Living Economy. Once accepted, social enterprises will receive a free assessment to identify their strengths and weaknesses, helping us match training, marketing and community outreach tools to each campaign team’s unique needs. Unlike other crowdfunding platforms, you’re not on your own when you launch a crowdfunding campaign with TLC Monadnock. You will have a community of business advisors, marketing experts, and experienced crowdfunding coaches supporting you. While there are no upfront costs, TLC Monadnock charges a 5% fee that is applied to all contributions. This fee is used to pay expenses associated with hosting, administering and promoting TLC Monadnock and for providing direct assistance to campaign creators. Think of this as a “Pay It Forward” fund instead of a fee. To view our Request for Proposals, please visit tlcmonadnock.com/rfp or contact me at marketing@monadnockfood.coop or 603-283-5401. TLC Monadnock is a community-based crowdfunding platform that empowers individuals to support the businesses, organizations and initiatives that grow wealthier and healthier communities in our region. Crowdfunding, or the practice of raising funds to support a project from a large number of people, is a viable alternative to recruiting businesses from outside the region to boost economic activity. Over the past two years, TLC Monadnock raised over $90,000 for fourteen crowdfunding campaigns. TLC Monadnock gives preference to campaigns that align with their respective city or town's master plan and contribute to a local, green and fair economy. TLC Monadnock is currently hosted by Monadnock Food Co-op and supported by the Greater Keene Chamber of Commerce, Greater Peterborough Chamber of Commerce, New Hampshire Small Business Development Center and Monadnock Economic Development Corporation. 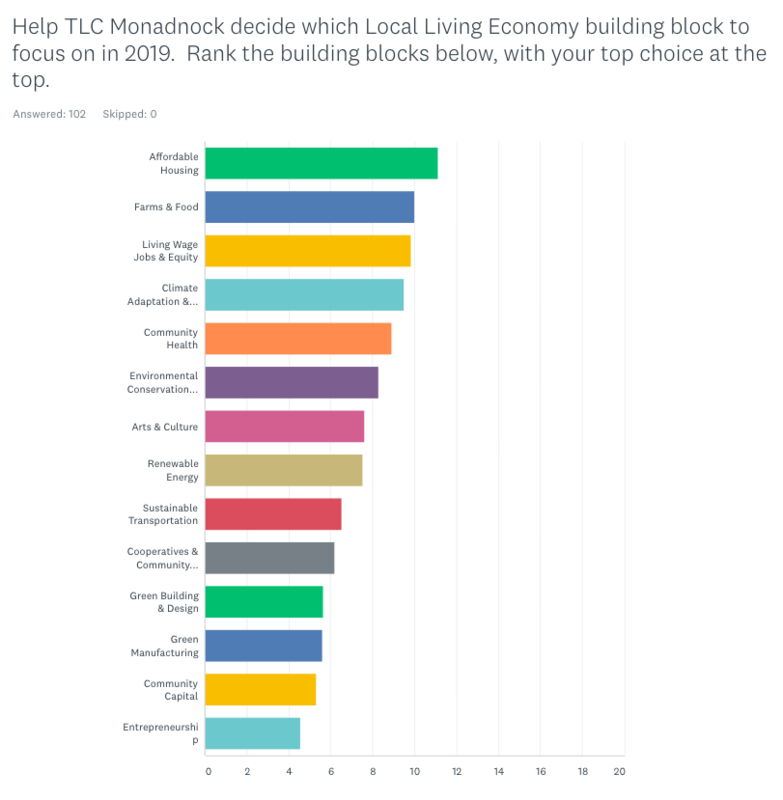 Thank you to the 100+ community members who helped The Local Crowd (TLC) Monadnock, a community-based crowdfunding program, decide which Local Living Economy building blocks to focus on in 2019. We will focus on recruiting projects working on innovations in these building blocks and will also provide these projects with extra support to run successful crowdfunding campaigns. Know of a social enterprise working to strengthen one of our top Local Living Economy building blocks? Please share our call for proposals with them today! Do you have an incredible project just waiting to happen -- one that would strengthen your business, our community and the local economy -- if only you had the funds to make it happen? Is your business a "social enterprise" that addresses social and/or environmental issues? Will your project support community goals, while keeping to a budget of $15,000 or less? If you said yes to these questions...THANK YOU! You are part of the emerging Fourth Sector economy -- a sector that uses the power of business to do good things for people and the planet. The Local Crowd (TLC) Monadnock believes in people like you. That's why we're participating in a new research project in conjunction with the National Science Foundation and The Local Crowd designed to uncover the best ways to support Fourth Sector enterprises. We are pleased to invite you to participate in this project. We will accept proposals until 5 p.m. on Friday, May 10, 2019. TLC Monadnock will select up to six local businesses to participate in this pilot study -- and the top proposal will receive a free crowdfunding video from 710 Main Films to support their campaign. Have questions? Please contact Jen Risley at marketing@monadnockfood.coop or 603-283-5401. The Local Crowd (TLC) Monadnock, a community-based crowdfunding program serving the entire Monadnock region, has been selected to become one of four pilot study sites for a National Science Foundation (NSF) research project. This NSF project is designed to identify and support the needs of fourth sector enterprises, also known as social enterprises, which are mission-driven organizations that use business principles to make the world a better place. TLC Monadnock will test and evaluate a new educational/crowdfunding platform developed by The Local Crowd, LLC (TLC) a Laramie, Wyoming based firm. TLC received a $225,000 NSF grant to conduct this research, which has the ultimate goal of increasing community awareness and support for social enterprises. "This project will support existing triple bottom line businesses in our region while encouraging new enterprises to explore this sector of our economy," said Jen Risley, TLC Monadnock Program Manager. "We couldn't be more thrilled to take TLC Monadnock to this next level." For more information, visit tlcmonadnock.com or contact Jen Risley at marketing@monadnockfood.coop or 603-283-5401. In addition to TLC Monadnock, the communities of Goshen, Indiana; Laramie, Wyoming; and Omniworks™ Business Incubator, Los Angeles, CA, will also serve as pilot sites. This research project will be conducted through 2019. The Local Crowd's crowdfunding/education platform is designed to solve social problems and make the world a better place by catalyzing community support for social enterprises. 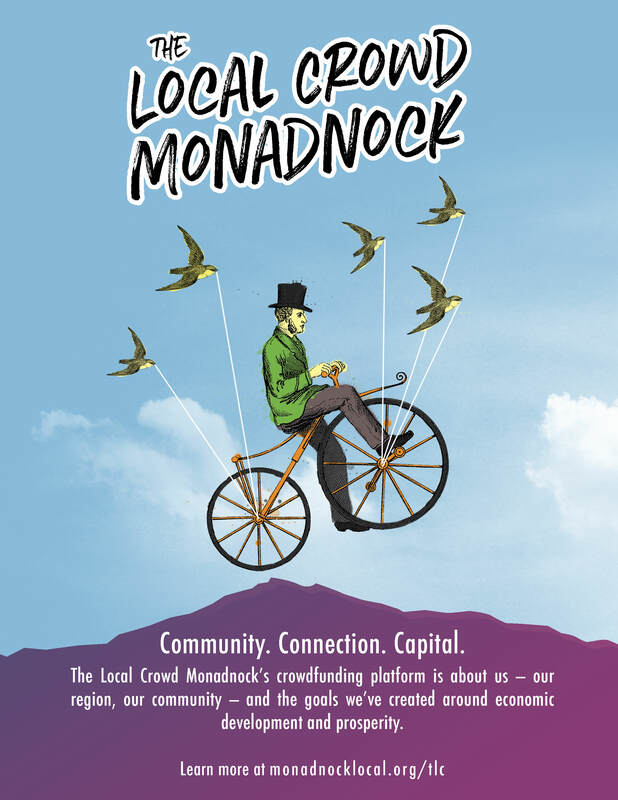 The Local Crowd Monadnock is a community-based crowdfunding program helping start-up ventures, early-growth stage companies, and community-focused projects find access to capital. 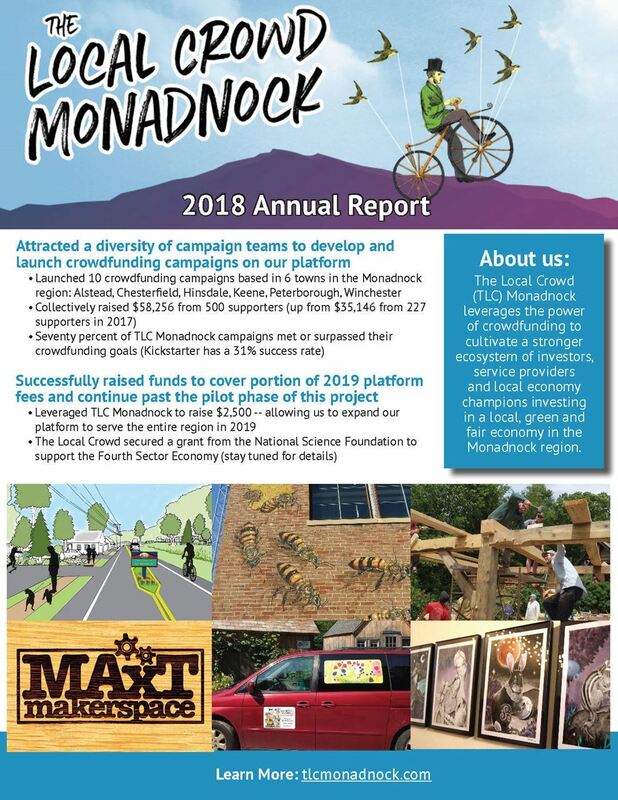 Since TLC Monadnock launched in March 2017, fourteen crowdfunding campaigns have collectively raised over $90,000 from 700 individuals. America's Seed Fund, powered by NSF, awards $200 million annually to startups and small businesses, transforming scientific discovery into products and services with commercial and societal impact. Startups working across almost all areas of science and technology can receive up to $1.5 million in non-dilutive funds to support research and development (R&D), helping de-risk technology for commercial success. America's Seed Fund is congressionally mandated through the Small Business Innovation Research (SBIR) program. The NSF is an independent federal agency with a budget of about $7.8 billion that supports fundamental research and education across all fields of science and engineering. The Pop-Up Economy: Making Our Communities POP! Whether a pop-up shop, pop-up event or pop-up planning process – the Pop-Up Economy means that whatever pops up is temporary. This temporary status makes pop-ups less risky than setting up something permanent and typically requires less investment of time and money. Some examples of the Pop-Up Economy in our region include the “Pop Up Holiday Shop” at Central Square in Keene and multiple Complete Streets demos hosted by Southwest Region Planning Commission in Keene and surrounding towns (see Keene’s Complete Street Demo video here: bit.ly/pop-upkeene). Our Pop-Up Economy also includes food trucks like Street & Savory and Salt & Lime. These mobile businesses aren’t temporary, but the locations where they set up their business can change. Beyond our region, two Pop-Up Economy examples serve as inspiration for building upon our own pop-up efforts: Night Market Philadelphia in PA and Western Market in Muskegon, MI. 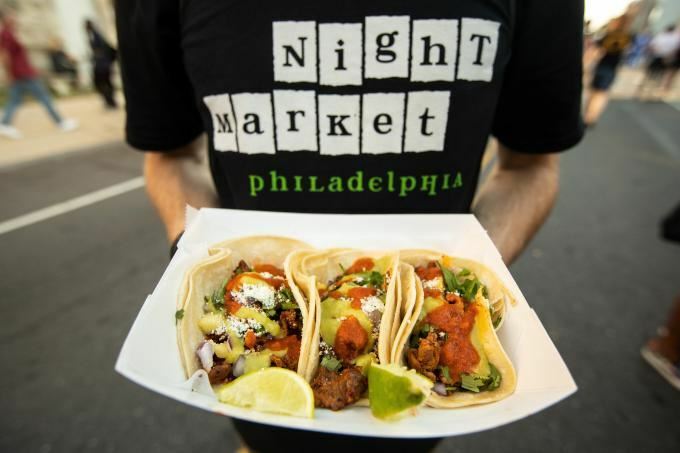 The F ood Trust, a nonprofit focused on access to healthy food, started Night Market Philadelphia in 2010. It’s a roving festival that pops up in different neighborhoods and brings communities together to celebrate the joy of food with food trucks, musicians, street performers and art installations. Each event is co-hosted by a community partner and supports existing businesses in each neighborhood by helping merchants secure permits to set up outside their storefront and attract more foot traffic during the event. Through a partnership with the University of Pennsylvania’s Healthy Food Truck Initiative, The Food Trust promotes food truck vendors who offer fresh, healthy menu offerings. They also work with Kiva Zip to bring 0% interest loans of up to $10,000 to local food entrepreneurs. These activities mean the community and economic impacts of Night Market Philadelphia ripple well beyond each one-night event. In 2017, the city of Muskegon built twelve small “chalets” on an empty lot and called it Western Market (in reference to their nearby farmers’ market). The chalets each cost about $5,000 to build and the city rents them to businesses for the season, from May to December. Last season’s businesses included a bakery, fair trade boutique and a variety of other retailers. While the initial funding for these structures came from donations from the local chamber of commerce, a community foundation and other area organizations, the success of Western Market (demonstrated by a waiting list of 25 businesses) convinced the city to use municipal funds to build five more chalets in 2018, locating them at different downtown locations. In addition to helping new businesses get a start, seven existing businesses from nearby communities used the chalets to grow their customer base. The success of Western Market motivated a number of downtown landlords to build smaller retail areas on their first floors to accommodate these growing businesses in the future. “We’ve taken very small spaces, like here at the Western Market, and much larger areas, like the farmers market, and turned them into vibrant places that draw people from miles around and provide an economic boost to our entire community,” said Muskegon Mayor Stephen Gawron. Have ideas to make your community pop with the Pop-Up Economy? Explore the opportunity to secure start-up funds for your idea through The Local Crowd Monadnock and email us at marketing@monadnockfood.coop. The Local Crowd (TLC) Monadnock is a locally based crowdfunding platform that empowers individuals to support the businesses, organizations and initiatives that grow wealthier and healthier communities in our region. We recently wrapped up the pilot phase of our program. Discover more details and updates at tlcmonadnock.com or contact Jen Risley at marketing@monadnockfood.coop or 603-283-5401. The Monadnock Food Co-op Farm Fund program, a partnership with the Cheshire County Conservation District, is now accepting applications from local farmers. Currently, in its third year, the fund has supported seven farms in our region. This year, the Farm Fund will award up to $18,000 to help farms in Cheshire County and abutting New Hampshire towns develop or expand their production for wholesale markets, including selling to the Monadnock Food Co-op and Food Connects. Funds can be used to support a range of projects including the purchase of equipment and infrastructure, packaging and labeling design needs, and technical assistance. The Request for Proposals and application are available here. Applications are due February 1, 2019. "The Farm Fund empowers local farmers to grow their businesses to help them become more financially sustainable," said Michael Faber, Monadnock Food Co-op General Manager. "It also helps the co-op broaden its offerings of locally grown, raised, and made foods — that means more local food for you, your family, and our community." Tax-deductible donations to this fund can be made to the Cheshire County Conservation District. Additional fundraising activities will occur at the Monadnock Food Co-op, including a Round It Up Donation Drive in early 2019. The Monadnock Food Co-op Farm Fund's mission is to support local farmers in increasing sustainable food production and wholesale sales to contribute to a thriving local farm economy. This grant supports several of the co-op's goals, including building a healthy, sustainable food system, supporting local farmers and producers, and contributing to a strong, sustainable and improving local economy. For more information on eligibility, to apply for a grant, or make a donation to the fund, please visit https://monadnockfood.coop/farmfund or call Amanda Littleton at the Conservation District at 603-756-2988 ext 116.